Like all wine producing countries, Austria has over the centuries drawn lines on a map to indicate regions of quality and (although they would never say it out loud), regions which should just stick to servicing the “entry level” market. The Wachau is the most famous of Austria’s prestige regions and names like Pichler, Knoll, Hirtzberger, Prager and Domaine Wachau are often the first that come to mind of journalists and the Gruner initiated all over the world. Texture is what the producers from this region will tell you sets them apart. The Weinviertel DAC is the region responsible for the bulk of Austria’s Gruner production, in every sense of the word. The largest of Austria’s wine producing regions has for decades provided fruit for the budget end of the market, mostly simple and fruit-driven styles with little texture. An analogy I could draw would be the Weinviertel DAC has the style and reputation similar to that of Australia’s Riverland. That being said, there are a few renegades who are shaking things up, putting quality above quantity. 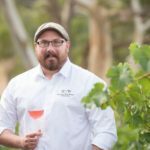 Swimming against the current are a handful of maverick producers using more modern viticulture and vinification techniques to make wines of finesse, texture and spice that have many other regions and Gruner fans taking notice. Ingrid Groiss is one such maverick. Since taking over winemaking duties from her father in 2010, she has steered the family business towards the top shelf. The 2016 Groiss Gruner Veltliner sparkles bright and clear in the glass while aromas of nectarine and white blossom ripple over the rim. 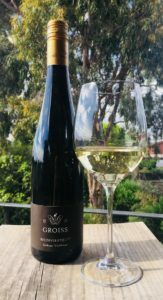 Where more traditional Weinviertel wines can show little minerality or complexity, time on skins and working the lees has given the Groiss a depth and richness that I really enjoyed. This wine is full-bodied but crisp with a delightfully long finish. The 2016 Groiss Gruner Veltliner can hold its head high amongst the best of her countrymen, so let’s do just that. Prager is a house with immense respect for the history of the Wachau; chief winemaker Dr Toni Bodenstein is a man obsessed with terroir and the mesoclimates of his region and this is reflected in his wines. His range is made up of single vineyard wines that see no oak so as to give each site a clear voice and personality. The terraced Hinter Der Burg (“behind the mountain”) vineyard is rich in primary rock and overlooks the Danube. 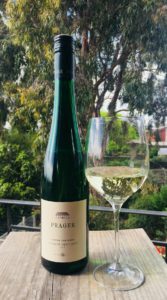 This 2016 Gruner Veltliner has spice and citrus in perfect union; the signature minerality of the Wachau is harmonising beautifully in the background and the chalky mouthfeel balances the whole package right to the end. The wines I tasted today represent two very different places but share a common vision. For decades the Weinviertel DAC deserved its reputation for lightweight, easy-drinking wines but there are rumblings. I think the days of writing off a whole region are numbered as more and more brave and inspired producers from the Weinviertel work hard to put their respective names on wines of quality, finesse and sophistication. And if producers like Toni Bodenstein keep releasing wines like the 2016, the Wachau’s global reputation is in safe hands. This entry was posted in Adelaide Hills, Adelaide Hills best Cellar door, Adelaide Hills Gruner Veltliner, Adelaide Hills wine, Adelaide Hills wine region, Blaufrankisch, cool climate wine, Gruner Veltliner, Hahndorf, St Laurent, wine, Zweigelt and tagged Adeaide Hills cellar door, Adelaide Hills, Adelaide Hills Cellardoor, Adelaide Hills wine, Adelaide Hills winery, Blaufrankisch, cool climate wines, Diurnal variation temperature grapes, Gru, Gruner Veltliner, Hahndorf Hill Gruner Veltliner, harvest, St Laurent, Zweigelt, Zweigelt Australia. Bookmark the permalink.